Pay It Forward is a concept that I have believed in for many years. Hearing someone (Thanks, Jessie!) say it last night caused a light bulb to go off in my mind. It was as if this was just the answer I was waiting for. You see, I create these little Angels that first came to me in a dream in the spring of 1993. (you can read more of their story by clicking on this link (http://www.teresacash.com/aboutlittleangels.html) My intention was crystal clear then and it is the same today. I wanted to find a way to warm someone's heart and ultimately bring a smile to their face that radiates from their heart. We all know that when we smile the world smiles with us. These little Angels are designed to deliver a special message from you. Here's how the Pay It Forward begins. 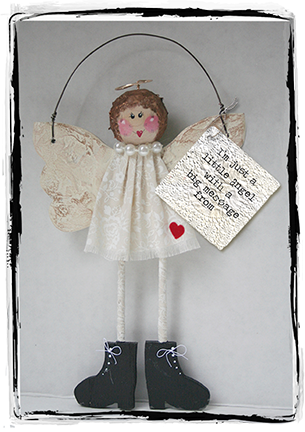 You order a little Angel from my website http://www.teresacash.com/myshop/littleangels.html I will send the little Angel to whoever you want me to send her to. Inside the note card she will carry your heartfelt message that will surely bring a smile to the someone's face. It can be a message of gratitude, expressing your concern if they are going thru a rough time in life, or even just a simple "I'm thinking of you". The point is you took the time to express your genuine appreciation for this person and you did it in a way that was unexpected. How cool is that! This is how I will help with Pay It Forward. For every little Angel that is ordered I will donate $5.00 to a charity that will help another person. If you have a favorite charity provide me with the name and it will be entered into a drawing. During this time (from now until November 30, 2013) I will also remove the shipping cost ($5.00) for you to send your little Angel.